Kourosh is a young reporter in Iran concerned with the many world problems that confront young people: “racism, xenophobia, discrimination, violent extremism, the fight for freedom and democracy”. He is sure one important answer is reliable information from youth-empowered media, where young professionals are not “beholden to big corporations and sponsors demanding big distortions of the truth in return for their funding.” He wants to tell us that there are many voices in Iran hoping to change the world for the better, and that he “will try to represent them fairly” at WFD2016. Screenshot of the World Forum for Democracy 2016 Opening Plenary. This week's theme is what education can do for democracy. From November 7 - 9, the openDemocracy team attended the World Forum for Democracy 2016 on education, equality and democracy. 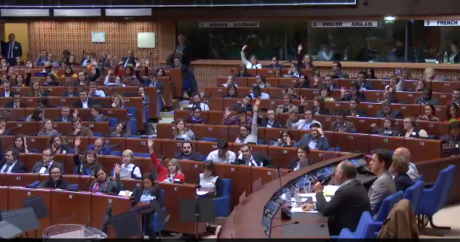 For three days in the Council of Europe in Strasbourg, we had access to thought-provoking plenary debates, 'Labs' where innovations in education and democracy from around the world were presented and energetically debated, and all the people involved. This World Forum for Democracy was particularly exercised by the centrality of education to democratic societies at a time when social divides not only persist but are growing worldwide.You can follow our response to the challenge in the discussion we are building here and over the next six months. What role should education play in bridging cultural divides in society – ethnic, religious, linguistic and many more – and in contributing to building the open minds and confident identities that can thrive in the diverse, interconnected world of today? 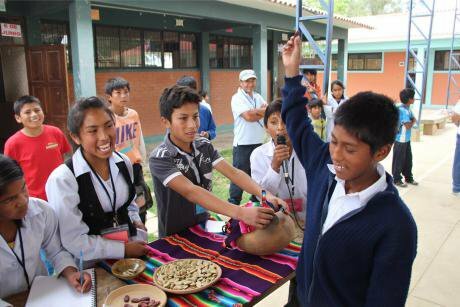 Could education systems do more to foster the civic values and skills needed not only for the functioning of democracy, but also for its evolution towards a more participatory and inclusive modus operandi? How can education, formal and informal, not only preach but practise democracy? Last year, we published thoughtful pieces on hate speech by members of the group of young people attending from around the world. This year, we wanted to involve some of the 70-strong contingent in a more proactive way, and so asked the organisers if we could set up a WFD Youth Citizens’ Newsroom over the preceding week-end to help us cover this ambitious event. This would reflect its imaginative format as a ‘democratic exercise in itself’ – and offer some young people a unique opportunity to cover an important global debate about their futures as it unfolds. 21 young people – the quotations above belong to four of them – joined our team. It is a pleasure to introduce you to a range of interviews and commentary that streamed through our Newsroom with the help and inspiration of our colleagues, En Khong and Jo Tyabji, over the two days of conference. 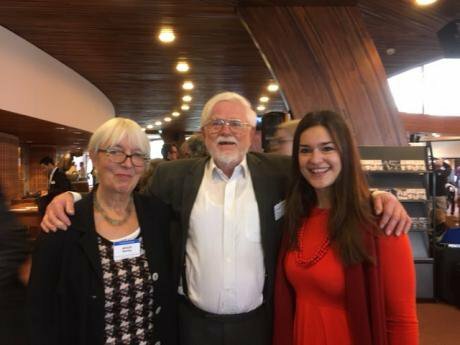 This year as well, we were closely involved with the overall event in another new way, with Rosemary Bechler acting as one of three rapporteurs charged with covering the activities of 21 LABS and reporting back on the highlights in the closing plenary. Last year, we covered the Forum on freedom and control in the surveillance age just after the Paris attacks. This year, the US election result brought another sense of history in the making to the closing day. So we hope to give you a unique glimpse into last week's sobering, but often inspiring and always galvanising, global exchange on the relationship today between democracy and education. How can education renew democracy? Since the referendum result on Britain's membership of the EU in June, a profound soul-searching has been under way, as can be seen in the priority concerns raised by four of the UK participants we caught up with as they made their way to WFD2016. Colin Crouch, author of Post-Democracy, confronted by the hostility to foreigners evident in and after the BREXIT result, warns us that "curiosity and a capacity for critical thinking can be gradually squeezed out of the population". Titus Alexander, author of a new book on Practical Politics, points out that, " It is remarkable how little difference there is between schools in authoritarian societies and many schools in democracies." Fellow-WFD rapporteur, Graham Smith, has been looking at how politicians encourage or otherwise important attempts to set up new forms of political participation. He is concerned because, "Opening up new forms... to hear the voices of the politically marginalised is critical for the well being of our polity." Anthony Zacharzewski, director of an organisation promoting good debate and new models of participative government agrees: "Any engagement approach not focused on getting the widest possible range of voices, and creating multiple environments in which they feel comfortable will be no improvement on the current system. Take diversity seriously." We complete our Monday front page offering with two rather different approaches to these challenges from the 2016 Forum. Derry Hannam (video,14 mins.) has been working in and for democratic schooling for over 40 years and takes us backstage on that history. Antonia Wulff ( 23 mins.) is leading the advocacy of Education International, world federation of teachers' unions, on the implementation and monitoring of the Strategic Development Goals. She has been involved with the democratic schooling in Finland that Derry Hannam so admires, but has a different set of priorities for strengthening state systems of education. Kelly McBride from the Young Citizens Newsroom and German filmmaker and democratic schooling proponent, Margarete Hentze, join Rosemary Bechler in the WFD Mediabox to find out more. Rosemary Bechler, Derry Hannam, Antonia Wulff outside the WFD Mediabox. On our Tuesday front page, founders of democratic schools from Israel, the Netherlands, France and beyond. From Simone Haenen, in an eloquent account of her own life story, we learn what it is like to be a pupil who makes the transition from a state school to a democratic school, and how this is a preparation for life. Ramin Farhangi explains to a curious young reporter, Arleen, what happens when you involve students in real responsibility that has to do with transforming their own environment, and why he believes the Paris attacks call for an urgent redesign of the French school system and systems like them. In the closing session, Lyn Carson was the rapporteur who first acknowledged the role of these activists in shining a light on what has failed in mainstream school systems in the most advanced democracies. Can democratic schooling ‘scale up’ to meet the challenge? Maybe not soon. But as Lyn points out, sometimes it is the sowing of small seeds which is the all-important catalyst for change. In Ukraine, amidst economic turmoil, regional division and war, some of the same principles of democratic citizenship education are guiding an urgent process of renewal and reform. Again we learn from Iryna Sabor that the transformative process comes “not from above but from within." EUDEC group meeting at the World Forum for Democracy 2016. See Yaacov Hecht in Related articles. This Wednesday, we showcase the work produced by our youth newsroom, which trained young participants at this year’s Forum in essential ‘citizen journalism’ skills – providing them with the frame of mind and basic toolkit to elicit stories from visitors to the WFD. In less than three days the newsroom in the hemicycle became a hubbub of activity with regular editorial meetings in the lunchbreak and at the end of the day. You can browse many of the results on our current World Forum for Democracy 2016 page. For the openDemocracy editors, the curiosity and expectation of the youth news team gave us an added investment in the Forum’s future-oriented discussions, and brought fresh lines of questioning to our media box interviews. Two youth reporters, Karyshma Gill and Yasser Machat began by digging beneath the surface, photographing and asking visitors about the (often deeply) personal reasons that had brought them to the Council of Europe, in their Humans of the World Forum for Democracy feature: “We are lucky to be here”, Gleya from Tunisia tells them, “but, when we go home, it will be hard”. Immigration was central to Forum discussions this year. Inclusive, democratic educations means including refugee children too, writes Kourosh Ziabari. While the Forum rose to the challenge of “democracy discovering its own mortality” as the French Minister of Education put it, by asserting that “the answer is not less democracy, but more democracy” – what that democracy will look like, Kelly McBride warns, is still to be determined. You have perhaps come across Kelly before, delighting Antonia Wulff with her questions about the Sustainable Development Goals for Education in the Mediabox. Now she has a question for all of us: how do we develop a collective vision for this planet’s future? 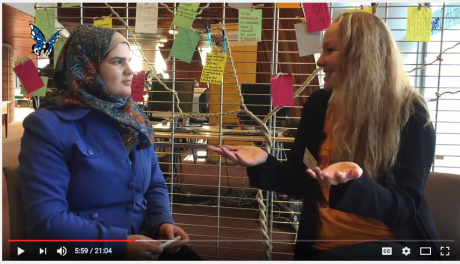 Screenshot: Saja Shami interviews film-maker Nora Bateson at the openDemocracy youth newsroom. See Related Articles. Yesterday, we met the youth newsroom team, and heard their concerns as they brought their own most pressing questions to the table, young people like Astrid, who wanted to know “how we can talk about changing education” without “talking about the system that that education is made for.” Today, we continue our youth newsroom coverage of a conference in full flow, by following our young reporters as they begin to think beyond the bubble of the Forum, and react to fast-changing, real-world events. Pre-vote, Brendan Schultz, a young American in Strasbourg, takes a personal look at why he voted third-party in this year’s US elections. Then we convene a special newsroom roundtable to reflect on the dramatic results. In the closing session of WFD2016, Brendan receives a standing ovation otherwise reserved for the LAB prizewinners. “I am very scared of what is happening in Europe,” one young reporter admits, “we are always at the risk that our democracies will be lost.” Democracy is not something you take from one country and put in another, Dr Sakena Yacoobi tells Fernando Ramirez. Our reporters agree that the democratic schools model has been central to the Forum this year – but could it be just a fad? Arleen Pimentel goes in search of some answers. Finally, we hear how the WFD youth programme has provided a ‘safe space’ for one of those students who has become a teacher in digital citizenship, while Ferya Ilyas brings things to a close by asking youth participants: what did you learn today? Day Five: Don’t mourn, self-organise! 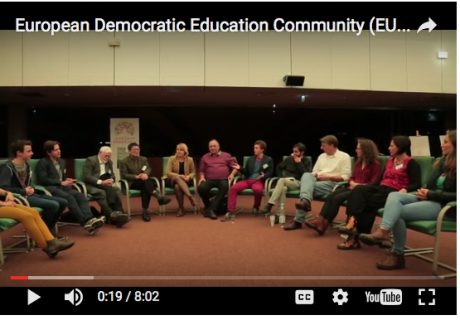 Over the coming months, we will be featuring stories about and extending debates from the discussions on education, inequality and democracy which took place in Strasbourg at the World Forum for Democracy on November 7 – 9, 2016. But today, Friday, we finish our first special week bringing you coverage of the event itself. One of the undoubted highlights of the week was Sacha Joshi’s ‘very beautiful bus’ : he tells Alex Sakalis about ‘Education on wheels’ ( Video 4 mns.). Then there were the three finalists for the Council of Europe’s 2016 Democracy Innovation Award, presented in the LABS and voted on by the participants in the closing session of the Forum. We have already shared Nicolas’ interview with Moses Machepiso, proponent of the MaYouth Civic Education Initiative in Zimbabwe. But, here we tell you about the winning finalists – the ingenious Berlin-based social start-up, Kiron, that delivers higher education to refugees regardless of status and overcoming many barriers bureaucratic, financial and legal in the process; while Adam Cronkright, chronicles the shift from “elections, full-year terms, and hierarchy to lotteries, rotation, and horizontal teamwork” that has made student governments more inclusive, participative, and representative in public schools in Bolivia. The three rapporteurs in the closing session were given ten minutes each to sum up their chief findings from the Forum, which after two days attending plenaries and LABS teeming with presentations and discussion was a pretty challenging ‘ask’. You can begin to see why if you look at our closing selection of projects and conversations: UNWRA’s global citizenship scheme for Palestinian refugee school students; the philosophy of integration of Anja Van den Durpel who spends her time getting conversations going in Belgium; the philosophy behind ‘self-organised learning environments’ as practised by Alijandro Inti Bonomo in less advantaged neighbourhoods in Buenos Aires; the intergenerational and intercultural programme initiated in France and spreading through Europe restoring links between the generations: Valon Kurhasani’s New Media School in Kosova that utilizes the skill sets of their young people, “enabling them to take initiatives that will contribute to the community and promote democratic values and participation” and the Vaga Lume Association in Brazil which connects the children of the Amazon region with those in São Paulo, to the mutual inspiration of both. Luckily, we have much more time at our disposal to explore these and many more rich innovative experiments worldwide over the coming weeks. But for now, we hope we have convinced you, whatever your age, that the relationship between democracy and education, formal and informal, is crucial for all of us, especially given the huge challenge of inequality in our world – and that it is time at least that we knew better what questions to ask. You can see Rosemary Bechler’s ten-minute attempt at a WFD2016 overview for the closing session, here.